The Pilot Mountain turquoise mine, also known as the Montezuma or Troy springs, is at the southern end of the Pilot Mountains in Mineral county, Nevada and was discovered in 1905 by William Miller of Tonopah. 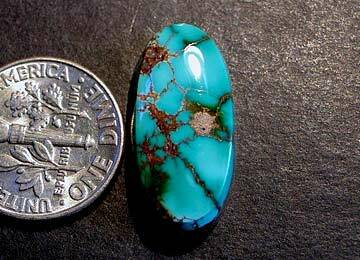 A hard turquoise with colors ranging from a bright blue, to a dark blue with a greenish cast, to very dark blue. Strong dark brown limonite mottled patterns are associated with this material. Pilot Mountain, though thin veined, is a very beautiful gem turquoise.